Today, Apple announced that the iPad will be available in nine more countries on Friday, May 28th. These countries include; Australia, Canada, France, Germany, Italy, Japan, Spain, Switzerland and the UK. Customers in these nine countries can begin pre-ordering the iPad on Monday, May 10th via Apple’s online store. Apple’s press release also states that the iPad will be available in Austria, Belgium, Hong Kong, Ireland, Luxembourg, Mexico, Netherlands, New Zealand and Singapore sometime in July. Check out Apple’s full press release below for more info. Below is the International Price List for all versions of the iPad. 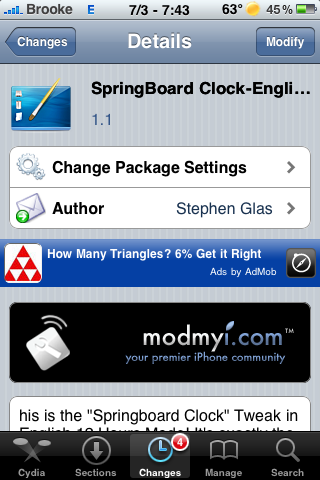 This mod was originally released in a different language however, it was then re-released in English called SpringBoard Clock-English. 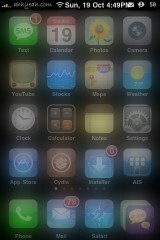 What the mod does is add the Date and Time to the bottom of the SpringBoard where your page dots normally are. 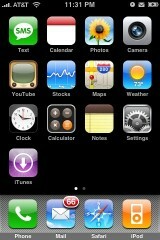 It looks the best if used with smaller icons. If you are using the stock size icons, you can turn on the Transparent Dock mod, and that will allow the SpringBoard Clock to fit a little better. The application package also includes an html file if you would like to ssh in and do some of your own customizations to the mod…it is located in the Library/Themes/Springboard Clock – English.theme folder. I have had 9-Toolbox on my iPhone for quite some time now and I have to admit that, at first, I was slightly overwhelmed by the application. 9-Toolbox really is nine applications rolled into one. 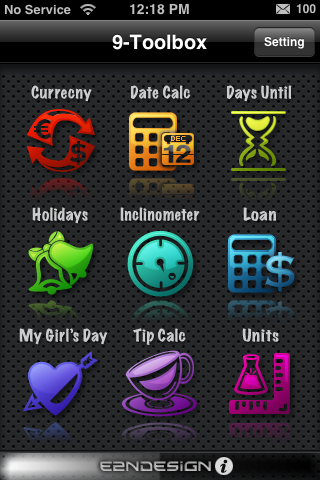 Because of the extensiveness of the app…I will just give you a brief description about each of the nine tools that are available in the app which include; Currency, Date Calc, Days Until, Holidays, Inclinometer, Loan, My Girl’s Day, Tip Calc and Units. Lockscreen Clock Hide is a mod that removes the time and date from your lockscreen leaving you with just a blank lockscreen. What is cool, is that it replaces the little lock icon that is normally on your status bar when your iPhone or iPod Touch is locked with the time! 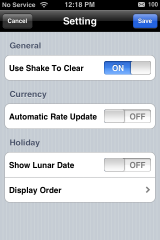 So, you don’t actually completely lose the time…it just gets moved to your status bar! As soon as you install the app…it activated the mod (it is not activated/deactivated via WinterBoard). To get your date and time back, just uninstall the app. I had no issues installing or uninstalling this application. 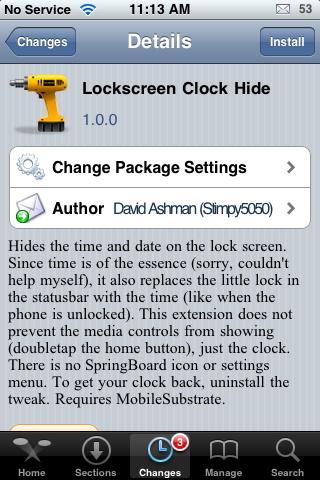 You can get Lockscreen Clock Hide via the david.ashman.com source. 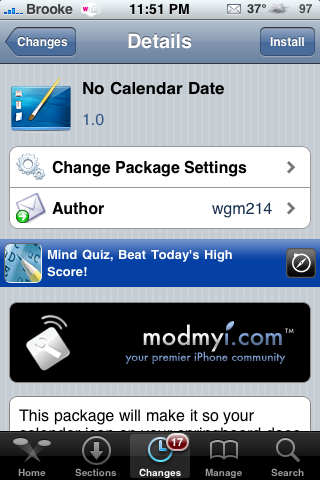 The No Calendar Date application is a mod that will remove the date from the calendar icon on your SpringBoard. As the developer mentions in the More Info, this is nice for themes that have smaller icons…most likely for those of you using the FiveIrows mod or the FCSB mod. 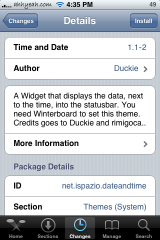 When you install the No Calendar Date application, it will be added into WinterBoard where it can then be activated/deactivated. 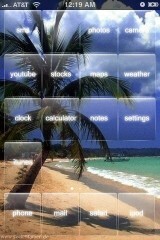 In order for it to display correctly, you will want to move it above your theme in the WinterBoard list. Screenshots below. Whenever I get bored, I usually take a trip to the App Store and do some window shopping, preferably strolling down the free aisles of the store. 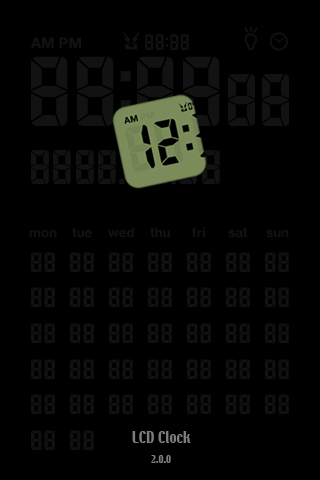 One app that often showed up in the Top 25 was a utility that acted as a clock display and alarm clock. I never downloaded the app since I didn’t really find a need for the program. However, LCD Clock came up as an assignment, so I finally got to see what all the fuss was about with these clock/alarm utilities. 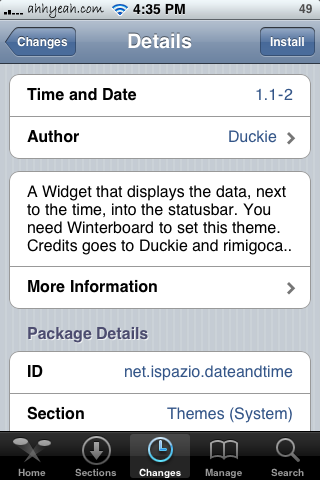 Date & Time is a WinterBoard mod that adds the current date and time to the StatusBar on your iPhone or iPod Touch. 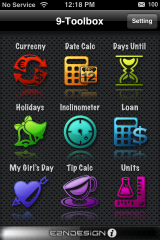 I’m not exactly sure why you would need this mod because the time is already on your statusbar and the date is on the Calendar icon. But, if you are looking to see the date and time with one glance…this might just be the mod for you. I did find that if you are using an app that has statusbar notifications, it can overlap the notification depending on how many you have. You can get this mod via the iSpazio source. 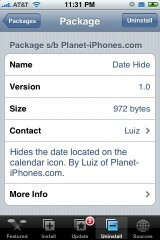 When Date Hide is installed, it will remove the date from the Calendar icon on your iPhone’s SpringBoard. It will remove both the day (Friday, Saturday…) and the number (13, 14…) from the Calendar icon. This is great for themes in which the date does not fit correctly on the Calendar icon. I was able install and uninstall this application with no problem. 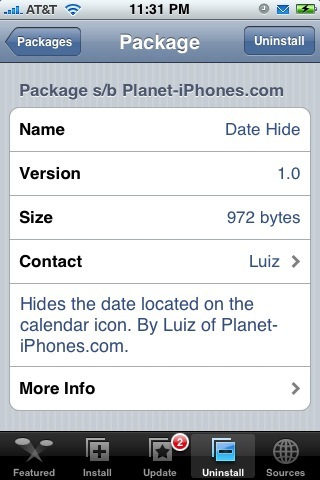 You can get Date Hide via the Planet-iPhones source. Note: When you install Date Hide…it will not add an icon to your SpringBoard it will just automatically take off the date on the Calendar icon.